The Week of the Underdog? Could this be the week of the underdog? 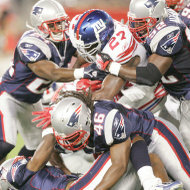 The Giants rallied past the Patriots. Now, could Barack rally past Hilary? Could McCain get the bid that was unforeseen only months ago? Time, maybe even hours, will tell. I think undecided Americans like rooting for the underdog. It is a more compelling story than rooting for the favorite. The question is, will they show up and support the underdog? A compelling story can get people talking. But, talk is one thing; action is another. Here’s an update on Super Tuesday’s action.